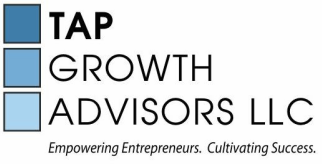 When you sign up for our mailing list, apply to be a TAP Growth Advisors client or consultant, and contact us electronically, you may be required to provide us with personal or business contact information about yourself, such as your name, address, company name, and email (collectively, the “Personal Information”). We do not collect any Personal Information from you when you use the Site unless you provide us with the Personal Information voluntarily. a. From You. Additional information about yourself that you voluntarily provide to us, such as your service preferences. b. From Your Activity. Information that we automatically collect when you use the Site, such as your IP addresses, browser type and language, referring and exit pages and URLs, date and time, amount of time spent on particular pages, what sections of the Site you visit, and similar information concerning your use of the Site. If you have provided us Personal Information, you may access, review, and make changes to your Personal Information by contacting us as set forth below. In addition, you may manage your receipt of marketing and non-transactional communications by clicking on the “unsubscribe” link located on the bottom of any TAP Growth Advisors marketing email. We will use commercially reasonable efforts to process such requests in a timely manner. You should be aware, however, that it is not always possible to completely remove or modify information in our subscription databases. We use the Personal Information and the Other Information to process your requests, solicit your feedback, inform you about our products and services and those of our third-party marketing partners, and to improve our Site. Also, we may share Personal Information and/or Other Information as described below. In an ongoing effort to better understand our users and our Site, we might analyze the Other Information in aggregate form in order to operate, maintain, manage, and improve the Site. This aggregate information does not identify you personally. We may share this aggregate data with our affiliates, agents, and business partners. We may also disclose aggregated user statistics in order to describe our products and Site to current and prospective business partners and to other third parties for other lawful purposes. We may employ other companies and individuals to perform functions on our behalf. Examples may include processing requests and providing marketing assistance, information technology support, and customer service. These other companies will have access to the Personal Information and the Other Information only as necessary to perform their functions and to the extent permitted by law. We may share some or all of your Personal Information and/or Other Information with any of our parent companies, subsidiaries, joint ventures, or other companies under common control with us. To the extent permitted by law, we may also disclose Personal Information and the Other Information when required by law, court order, or other government or law enforcement authority or regulatory agency, or whenever we believe that disclosing such information is necessary or advisable, for example, to protect the rights, property, or safety of TAP Growth Advisors or others. We take commercially reasonable steps to protect your information from loss, misuse, and unauthorized access, disclosure, alteration, or destruction. Please understand, however, that no security system is impenetrable. We cannot guarantee the security of our databases, nor can we guarantee that the information you supply will not be intercepted while being transmitted to and from us over the Internet. In particular, e-mail sent to or from the Site may not be secure, and you should therefore take special care in deciding what information you send to us via e-mail. The Site is operated in the United States. If you are located outside of the United States, please be aware that any information you provide to us will be transferred to the United States. By providing us with any information, you consent to this transfer. © 2015 TAP Growth Advisors, LLC. All Rights Reserved.